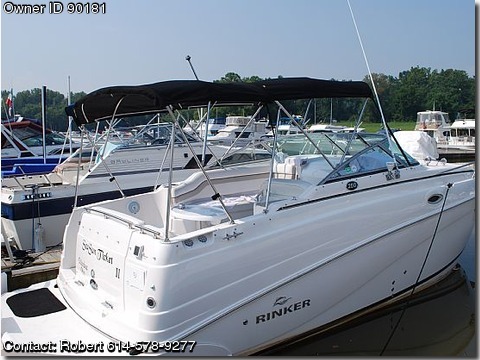 2007 Rinker Viesta Vee 250,Cruiser loaded with features and low hours! The camper canvas and mooring cover are in excellent condition. Extras include a compass, snap-in carpet, depth finder, VHF radio, Lowrance Fish-finding Sonar and Mapping GPS, flip-up bolster, hot & cold transom shower, and a power engine hatch. The cabin is beautifully appointed in earth tone leather and wood veneer and has a microwave oven, dual-fuel stove, refrigerator, and CD stereo with IPod adapter, mounted flat screen television. Spacious aft cabin sleeps 2. The head is pump-out with a holding tank. Systems on the boat include dual batteries with switch, battery chargers, battery inverter, trim tabs, and a hot water heater. Boat comes with tandem ez-roller trailer. Portable front hatch air conditioner included. Volvo Penta Engine, 280 HP, low hours! Neutra Salt Engine Flushing System.